We are nestled on a bluff, overlooking the bay and Pacific Ocean in the little hamlet of Agujitas, Drake Bay, Costa Rica. This is the gateway to the precious Corcovado National Park, the best diving and snorkeling at Cano Island, and great whale watching, along with a variety of other activities. We invite you to come enjoy these activities along with the quiet beaches a few hundred feet from your door! We are devoted to ensuring that your stay is the best it can be. We have had the honor of receiving Tripadvisor's Certificate of Excellence for six years running. From orthopedic mattresses, to the precious hardwood beds and air-conditioned rooms, we trust you will be comfortable with your stay at Casita Corcovado. 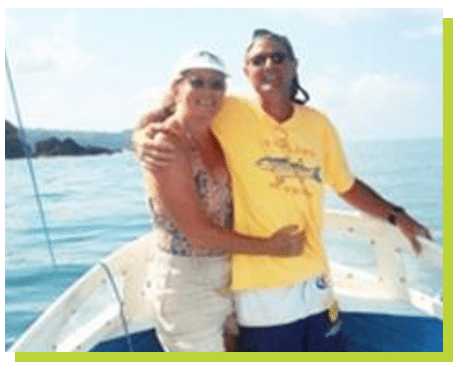 Originally from the Northwestern U.S., we gave up the cold winters for sunny Costa Rica and love sharing our beach house rentals with friends from all over the world. People often tell us they feel like they are at home when they stay at Casita Corcovado. We hope you will feel the same. We await you in Drake Bay, where the beaches and lush foliage beckon with warm breezes, gardens, and diverse wildlife. © 2018, Casita Corcovado. All Rights Reserved.